Have you ever noticed that, while the flesh of tomatoes and stone fruit will soften, the skin seems to remain intact no matter how long it cooks? And that the leathery bits of skin can just about ruin whatever dish they’re in? Tomato sauce or peach pie with scraps of tough peel—yuck. But how do you peel tomatoes or stone fruit without ending up with bruised fruit and a big juicy mess? Knives and vegetable peelers are no help here. Well, do you remember Blanch? It’s been a while since I introduced you. Blanching is the answer! Blanching fruits such as tomatoes, peaches, nectarines, plums, and apricots will loosen their skins and make peeling a breeze. 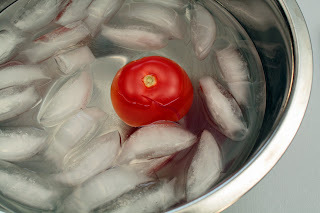 To peel tomatoes or stone fruit, bring a large pot of water to a rolling boil. 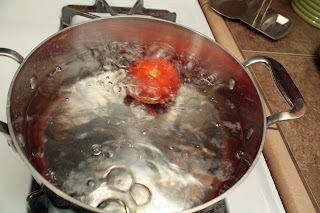 The larger the pot and the more water, the faster the water will return to a boil after the fruit is added, and the faster the skin will release. And the faster the skin releases, the more appealing the appearance, texture, and flavor of the fruit will be. Keep in mind that the goal is to loosen the skin but not cook the fruit. Add plenty of salt, enough to make the water taste slightly briny. 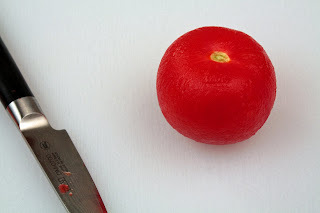 Using a paring knife, cut a small X in the bottom of the fruit. Add the fruit to the pot of boiling water and boil for 20 to 30 seconds. The skin of the fruit will usually start to crack. Using a slotted spoon or wire skimmer, quickly transfer the fruit to a bowl of ice-cold water to stop the cooking process, this is known as shocking. Once the fruit is cool, drain it thoroughly. 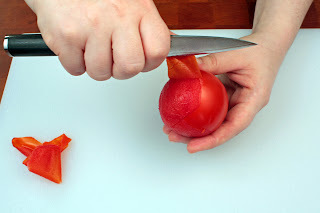 Use the paring knife to remove the peel, starting at the X. The skin will slip right off. 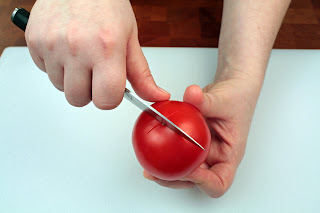 This technique can also be used to peel pearl onions, fava beans, and almonds, but it’s not necessary to score them with an X first. Blanch them for about a minute, then shock them in ice water. 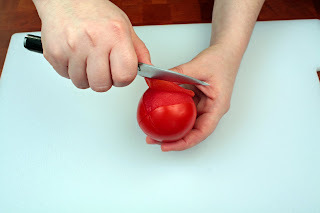 Use a paring knife to cut off the root end of pearl onions. Break open fava bean skins with your thumbnail. Then squeeze each pearl onion, fava bean, or almond between your thumb and forefinger, and it will pop right out of its skin. If you’re peeling a large quantity of one of these foods, blanch it in batches. Great trick, also works well for pearl onion skins, must score the root in an X first though. Love it! Great tip. But the crab, avocado and grapefruit combo sounds like something I've got to make!